The service sector is by far the largest sector. This is true in nearly every region of the United States. Personal Consumption Expenditures can be viewed as expenditures by the household sector. Services are overwhelming the largest category. Durable goods are clearly the smallest. The share equals the size of the component divided by the size of the total. The 2nd Quarter 2007 was the last quarter prior to the economic downturn. Data Source: The 2nd Quarter 2007 National Income and Product Accounts from the Bureau of Economic Analysis. This post chops the Oregon sample into two parts to look at income by age. The two parts are Tri-County (Clackamas, Multnomah, and Washington Counties) and what is commonly known as the “Other Oregon,” which is everywhere else in the state. The more urban Tri-County area has higher mean incomes at nearly every age. Important characteristics, which are true for nearly every population in a 20th century developed country, are a generally increasing curve, a peak near retirement age, and more urban areas generally have higher incomes than more rural areas. The division between urban and rural areas may be more or less dramatic depending on how well the economy is integrated. The graphic shows household mean income by age in Oregon estimated based on the most recent American Community Survey data. For the statewide pattern, please see: http://lindholmcompanyblog.com/?p=3950. Source: American Community Survey Population and Housing Public Use Microsample files, 2008 1-year sample. Two important characteristics, which are true for nearly every population in a 20th century developed country, is a generally increasing curve and a peak near retirement age. In general, higher payrolls tend to track higher employee/population ratios. The one exception is 97403, which combines the University of Oregon and Glenwood areas, where there the job/person ratio is low, but the payroll/job ratio is high. For the numbers, please see http://lindholmcompanyblog.com/?p=3688. This difference might go a long way toward explaining Eugene’s divided politics, see http://lindholmcompanyblog.com/?p=3482. These numbers include only private sector, not government, employment. In particular, the University of Oregon and federal, state, county and city jobs are not included. Most of these ZIP Codes include some rural population. Most of the businesses are in the urban portions of these regions. The latest available official data on firms, jobs, and payroll at the ZIP Code level is from 2008 and for population at the ZIP Code level, it is 2000. Source: Census Bureau: 2008 ZIP Business Patterns and 2000 Census. This graphic shows pretty clearly that the most volatile GDP components are investment and net exports. Consumption, by comparison, barely moves over time. The relative change equals the share of the change divided by the share (based on two earlier posts). The 2nd Quarter 2007 was the last quarter prior to the economic downturn.The 2nd Quarter 2010 has the most recent available data. For comparison with the share of each sector in the overall economy, please see: http://lindholmcompanyblog.com/?p=3646. Data Source: 2nd Quarter 2007 and 2nd Quarter 2010 National Income and Product Accounts from the Bureau of Economic Analysis. Investment accounts for the entire decline in GDP and then a lot more. Government and net exports actually have increased. 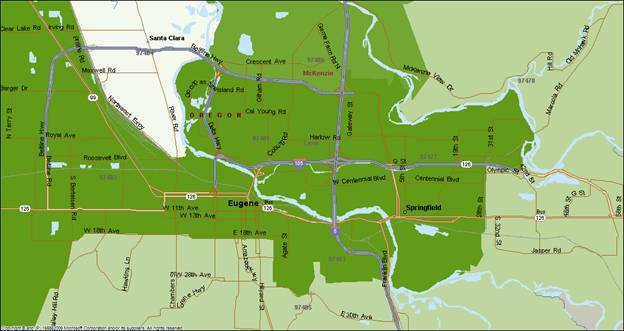 The three highest ratios of private-sector employee to population ZIP Codes are 97401 and 97408 in North Eugene and 97402 in West Eugene. The darker green “U-shaped” area in the upper half of the map. Please see http://lindholmcompanyblog.com/?p=3691 for the specific ratios. 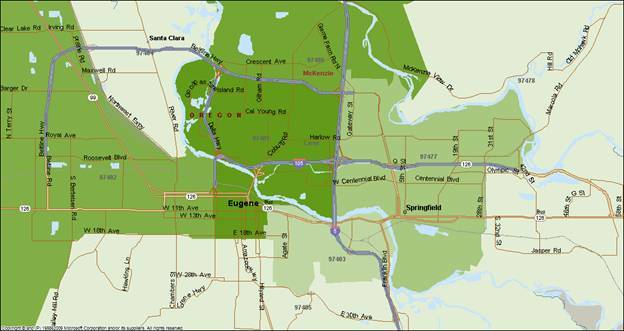 The three highest ratios of private-sector employee to population ZIP Codes are 97401 and 97408 in North Eugene and 97402 in West Eugene.